Cleaning is not always one of our favorite activities to do. However, I always want a clean house. I just don’t want to spend a great deal of time doing the job. I’m sure you don’t either! The great news is there are some great ways to get the job faster and more easily done. 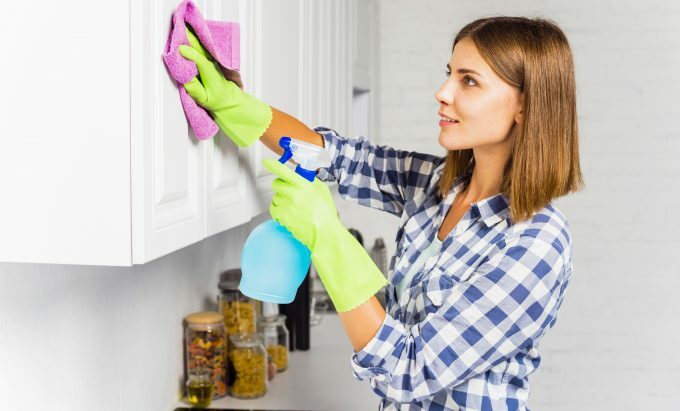 I have found some of the best speed cleaning shortcuts so you and I can both spend less time sweeping and scrubbing our homes and more time relaxing and being with our families! Most of these cleaning shortcuts involve a few minutes of cleaning as you go while doing your daily tasks. It might sound like a hassle, but you save hours of cleaning when you decide to get it done. If you have dinner that spills over in the oven, it makes it much easier to clean up the mess if you place an oven-proof bowl of water in the still hot oven. Turn the temperature of the oven to 400 degrees. Allow to cook for 20 minutes and then turn of the oven. The water will boil and steam to help loosen any food or grease stains. When the oven has cooled down, wipe down the oven with a sponge or paper towel. You can use the shower to remove wrinkles from your clothing. While you are in the shower hang your wrinkles clothes in the bathroom. The steam will help the wrinkles fall out of the clothes and save you time from getting the ironing board out. You could even throw them into the drier while you shower to remove some of the wrinkles. To save you 30 minutes of scrubbing the soap scum on the shower stalls and doors, you can do a daily 30 second task to save you time. Quick the shower or bathtub a quick wipe down with a towel or squeegee once you have finished using the shower or bathtub. Instead of keeping the garbage bags in a cabinet, store a few new bags in the bottom of the barrage can. Each time you empty the trash, you can easily put a new bag in the garbage can. Before starting your day, make your bed immediately when you get up. It makes the room look neater and only takes a couple minutes to make the bed before you go. I’ve taken the time recently to start decluttering my life, especially with the stuff I have in my house. By taking a few minutes each week to declutter one room, I have gotten rid of things I haven’t used in a long time. Tackling laundry is never a favorite task for me and I’m sure it isn’t for you either! I always feel I am behind on laundry, but by simply organizing the laundry into whites, colored, and delicates so the loads are presorted has been much easier. I can start a load of laundry every morning before heading out or doing other tasks and hang the clothes as they come out of the dryer. This makes it much easier and avoids worrying about wrinkles! Just a few minutes of cleaning has made a huge impact on how my home looks. There are plenty of things you can do at the same time. While the children are in the bathtub or waiting for the tub to fill, you can wipe down the bathroom counter tops, clean the sink, sort through the bathroom drawers, or even scrub the toilet. While you are cooking dinner and have some downtime, you can load or unload a dishwasher, sweep the kitchen floor, wipe down the kitchen counters, or clean out the refrigerator. If you live in a two-story home, make sure you never go up or downstairs empty handed without something in your hand that belongs in another spot. You can dust the room while you chat on the phone with a friend or relative. What are some of your cleaning shortcuts and hacks to get your cleaning job down faster? Share below with us in the comments!